"What the What if?" is the seventy-fourth comic issue, released on 25 February, 2015  in the US. When Bender accidentally causes the Professor's What-If Machine to explode, the city of New New York is divided into multiple "What If" scenarios. Only Bender and Fry are unaffected and must gather the parts needed to repair the machine to return things to normal. They enlist the help of a Zoidberg who is from a world where he is incredibly lucky, a Leela who never left the mutant underground and is painfully shy, and a Professor who just happens to be a kangaroo. According to this issue, five key components to the What-If Machine include: a bowl, a coil, a cog, a transistor and a motherboard. Farnsworth seems to have been growing a second clone. This one already has glasses on despite looking to be foetal. Scruffy has a monkey tail in one of the alternate What If? universes, but the last panel suggests he actually has one in the normal universe, too. Leela has a relationship with the Leg Mutant in an alternate reality where she was never put up for adoption by her parents. The gang end up in an alternate reality where everything is made of words, which results in them being able to see & read the caption balloons that normally only the reader would see, essentially breaking the fourth wall. The last alternate reality the gang end up in seems to have been taken over by Morbo's species (due to the Statue of Liberty being replaced by a statue of Morbo stood on a pile of skulls), but no one ever comments on this and no other tell-tale signs of an invasion are shown. 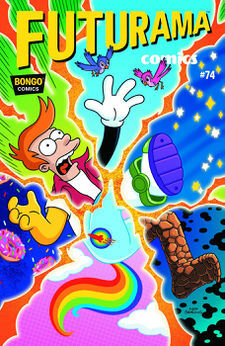 On the cover Fry is partially depicted in the forms of Mickey Mouse, Buzz Lightyear, the Thing, Rainbow Dash and Homer Simpson. In one alternate reality, Zoidberg is extremely lucky due to eating Fry's seven-leaf clover [3ACV04], much to Fry's annoyance. Kif has a speaking part in the cereal area despite cameoing in the Peanuts area. In the game show reality, Calculon says he'll be asking a series of questions and is looking for the answers, but Zoidberg provides him with a list of questions, suggesting it was meant to be a reversed round and the writer made a mistake. It might be a Jeopardy!-style game, in which case the answers are in the form of questions. The What-If Machine had previously blown up in "Twice Told Tales of Interest", but nothing happened afterwards to change New New York. Fry: So you see Professor, we just need to get all the parts together. Farnsworth: Yes yes, anything to get me away from that depressing donkey! Bender: I'll have you know I've got the brain of a supercomputer! Bender: Yeah, I took it from him while he was sleeping. Gonna try and pawn it after this! Fry: Wow! We kissed so hard my tooth got knocked out! Fry: Don't be! Aside from the incredible pain, this is the best day of my life!